I photographed Leah last summer. She is beautiful and gorgeous. As you see, she was wearing eye catching red dress. Since the color of her dress is intense pure red, I requested her to stand in front of old back wall. That brings good contrast between pail wall and her, and she is more standing out in the image. Now, a photographer have to work a little bit harder on the computer. I wanted to enhance my inner imagination of kind of Gothic, like Gotham city in Tim Burton version of Batman. So added rusty “yogoshi” weathering effect on entire image. I would be glad if you see the mood I saw in my imagination. Please click the idea to view larger image. This entry was posted in Photography and tagged Alberta, Calgary, calgary fashion photographer, Calgary photographer, calgary portrait fashion, Canada, Digital processing, Fashion Photography, Model photo session, Models, Photography, portrait, Visual Arts on June 22, 2016 by Hiro. Calgarians experienced extremely mild winter of 2015 to 2016. But still it is good to find a sign of spring arrived. I visited Drumheller and I found many crocuses blossoming in the badlands soil. Crocus would be a messenger telling us it is the end of long winter. This entry was posted in Photography and tagged Alberta, badlands, Calgary landscape photographer, Calgary photographer, Canada, crocus, Drumheller, fine art, Hiro, Hiro Kobayashi, Hiroak, Landscape, Landscape photography, Natue Photography, Photography, Visual Arts on April 29, 2016 by Hiro. I have been using range finder cameras as my main camera for over 20 years. I would say I am in a relationship with Leica. They are often assertive and frustrating, but when I treat the camera well and carefully feed good light the camera gives me stunning beautiful images. You know I mean…this is truly a relationship. On the other hand, Nikon D800 is job partner. It is reliable and covenient, but I don’t expect the “surprise” which I found in images from Leica. So I often take Leica. I use D800 for mostly for event photography or when I am lazy. Having said that, I have decided to taking D800 to Lake O’Hara trip in this fall. 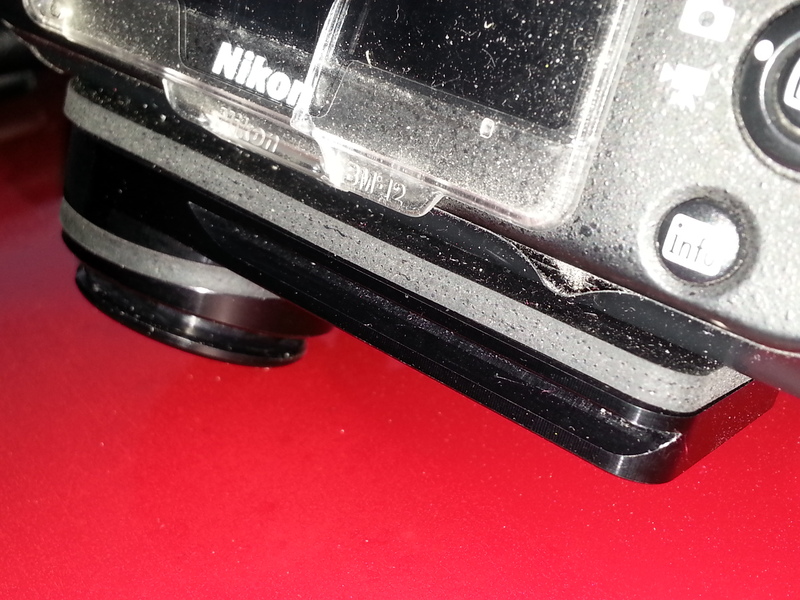 The reason is the shutter of my Leica M9 has become unreliable after 160,000 actuations. This is known issue of Leica M9. Lake O’Hara is considered to be backcountry so if something happens to a camera, I cannot get a spare camera easily. 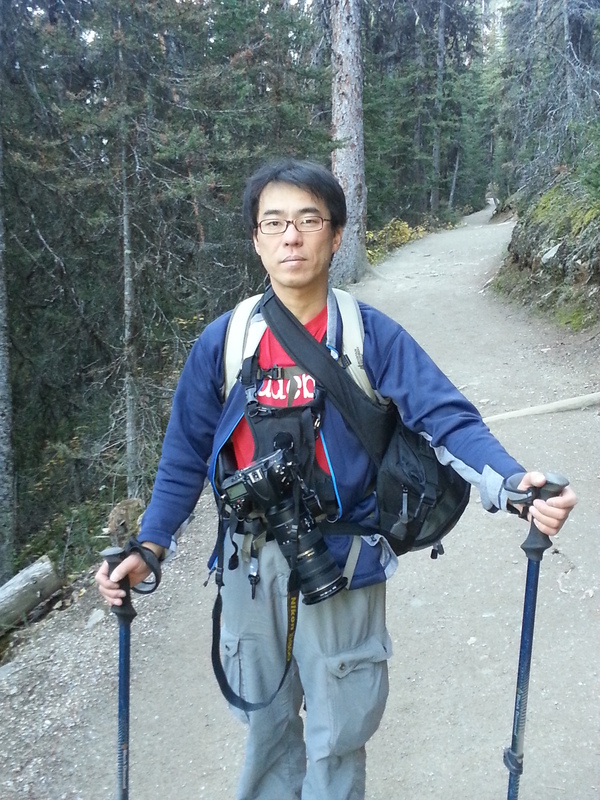 So I took my D800 for a hiking to lake Agnes as a trial. Also I got a Cotton carrier camera system so I tested the Cotton carrier system well. Here is my new look. Cotton Carrier is quite confortable. It is nice on my neck. I put 3 more lenses in a shoulder bag, but it was not heavy unexpectedly. Now I gave a “go sign” to myself to take Nikon system to Lake O’Hara. Another good thing about the Cotton system is a Arcaswiss tripod plate is coming with the kit. So I can put the camera on my panorama head as well. This is handy for landscape photographers. This entry was posted in Photography and tagged calgary landscap photographer, Calgary photographer, Canada, Canadian Rockies, Cotton Carrier, Equipment, Landscape, Landscape photography, Leica, Natue Photography, Nikon D800 on September 22, 2014 by Hiro. As I mentioned before I sometimes have precise vision of final image before I press a shutter button at the scene, but also I often just capture a scenery without particular idea of final image. Occasionally, images are just only “beautiful” and did not speak to me regardless of how process the image, but occasionally my imagination grows while I am editing the image. This is one of the such type of my photos. I took this photo in Jasper last year. I was shooting sunset on the mountains and reflection. While I was waiting for the sky turned to beautiful orange, this scene came to my eyes from the position I stood to different angle. I changed to long distance lens and took some shots. Even I did not use a tripod for this image. I edited the “beautiful” sunset shot but it did not speak to me even though I took hours for processing. Then I looked at this image. It somehow appealed to me. Although I needed some trials and errors before I got an idea of editing map to the final image, I like this image much better than the sunset image….maybe because this reflect my personality? The sunset image is staying in a hard drive; this image was exhibited at my Wabi-sabi wanderlust show in February and sold. By the way, I am on process of rebuilding my business and my business name will be changed to Wide Bright Sun photography from Wide Bright Pass Photography. I hope I can announce my new web site before long. 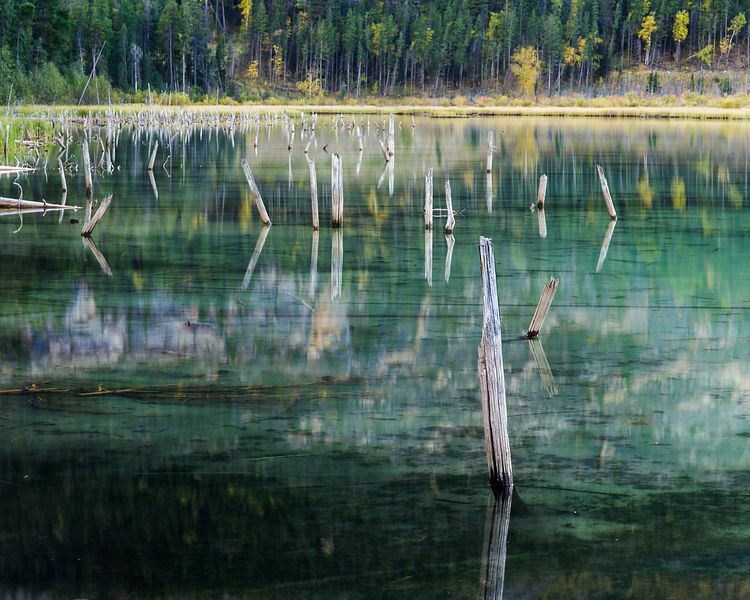 This entry was posted in Photography and tagged Alberta, Arts, Autumn, Calgary landscape photographer, Calgary photographer, Canada, Canadian Rockies, fine art, Jasper, Landscape, Landscape photography, National Park, Visual Arts on April 4, 2014 by Hiro. My photographic exhibition at Framed on fifth in February. It has been 2 years since Framed on Fifth, lovely framing and art gallery booked me for a gallery show. Now it is happening. Although 2 years seems long enough to prepare images, it passed very quickly. I must be a rain man and I got bad weather whenever I go to big trips. I end up to get many subtle, gentle almost melancholic images. Then I went through all landscape images I have taken since 2009. I realized I am getting more subtle images because my style may have been changing. 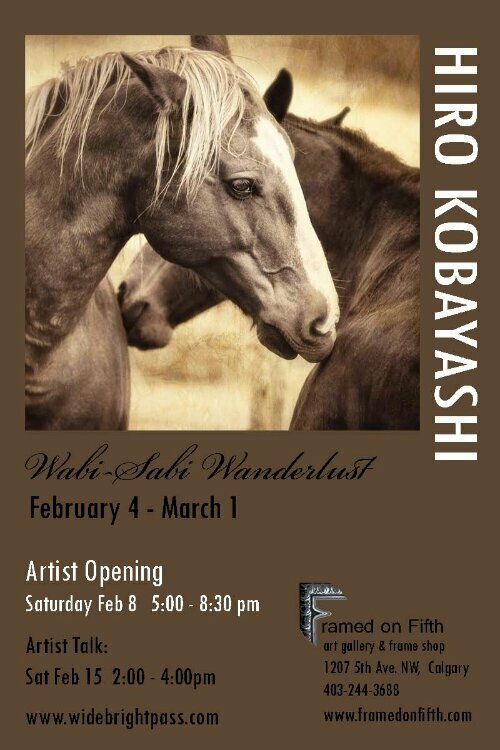 So I titled this gallery show, “Wabi-sabi wanderlust”. Wabi-sabi is Japanese term, in part portrays a true sense of serene melancholy and a spiritual longing. My show will be at Framed on Fifth (1207 – 5th Avenue N.W., Calgary) from Feb 1st to Mar 1st. The opening reception will be Feb 8th from 5pm. Also I will have artist talk, ” Meet the artist” on Feb 15th from 2 pm to 4 pm. I will have a photo critiquing session as a part of the artist talk. Please bring a couple of your photos. By the way, this show is part of Exposure Photo Festival 2014. Many gallery shows are listed this year as well. You should check the out. Lastly, I will share a time-lapsed video, I made for fun. Just check it out. This entry was posted in Photography and tagged Alberta, Arts, Calgary, Calgary landscape photographer, Calgary photographer, Canada, Canadian Rockies, fine art, framed on fifth, Gallery show, Landscape, Landscape photography, Natue Photography, Visual Arts on February 3, 2014 by Hiro.